A good defense is a prerequisite for modern team handball. The intention is not only to prevent goals but also to actively win the ball and subsequently initiate a fast attack. The offense should permanently be put under pressure and forced to make mistakes. 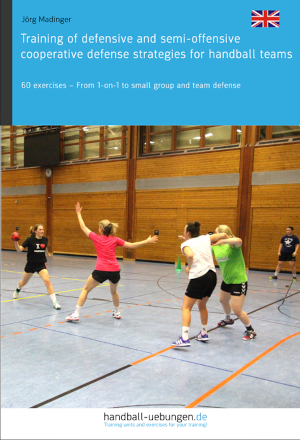 The exercises in this collection initially deal with the individual basics of defense play. Individual and position-specific training marks the starting point for subsequent cooperative defense play and allows for choosing the appropriate defense system. The basics both include exercises on legwork, 1-on-1 defense and covering the pivot in combination with fast adjustment to subsequent actions as well as blocking and anticipating on the wing positions of a proactive defense system. The second part of the collection deals with cooperative small group defense play and focuses on handing over/taking over attacking players along the defense line (width of defense) and on making agreements when defending against the pivot. The third chapter introduces cooperative team defense in 6-0, 5-1, 3-2-1, and 4-2 defense systems along with possible variants. Get inspired by the exercises, develop your own defense concepts, and make use of the individual strengths of your defense players for optimal cooperation.